The 2014 Open Championship is looming large and to celebrate the only major the US of A has been kind enough to let the inventors of the game keep, here are the top five moments in the tournament’s illustrious history. Last year’s Open at Muirfield was brilliant due to the high number of possible winners heading into the final round. But while many believed it would be one of Adam Scott, Henrik Stenson, Lee Westwood or even Tiger Woods – four birdies on the last six holes saw Phil Mickelson overcome a five-shot, 54-hole deficit to clinch a first Open title. One of golf’s most colourful characters, American John Daly, would go on to lift the Claret Jug at St Andrews, but not before Italian Constantino Rocca had sunk a 50ft putt on the 18th to force a play-off. Rocca laying fist-pumping on the ground in celebration is priceless Open imagery. 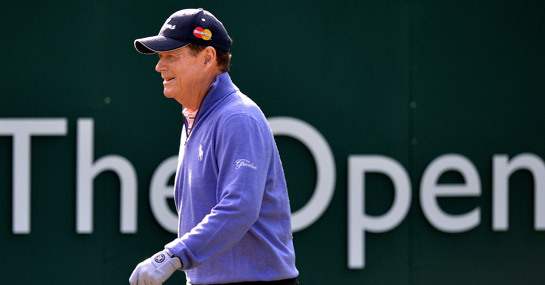 26 years after his last and fifth Open Championship triumph, no one expected a 59-year-old Tom Watson to hold a one-shot lead going into the 72nd hole. Agonisingly for the legend of the game, Watson failed to get up and down and eventually lost in a play-off. Still, it was a magnificent effort. That man Watson again, but this time back in his pomp and vying for a second Claret Jug against on-course nemesis Jack Nicklaus. Few rivalries in sport come close to these two slugging it out in majors and this most famous of tussles went to the very last putt at Turnberry. The English golfing public had been baying for a first Open winner since Tony Jacklin 18 years earlier and the man with all the pressure on his shoulders was Nick Faldo. However, while others faulted on the Sunday at a murky Muirfield, the ‘Par Machine’ made par on every one of his 18 holes to win by a stroke.